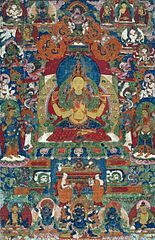 The Prajnaparamita Sutras belong to the Mahayana Buddhist scriptures dealing with the subject of the 'Perfection of Wisdom' (of the other shore). Thus have I heard. At one time the Blessed One together with many of the highest Bodhisattvas and a great company of Bhikshus was staying at Rajagaha on Mt. Gridhrakuta. The Blessed One was sitting apart absorbed in Samadhi Prajna-paramita. The Venerable Sariputra, influenced by the Blessed One absorbed in Samadhi, spoke thus to the Noble Bodhisattva Avalokitesvara: --If a son or daughter wishes to study the profound Prajna-paramita, how is he to do so? The Noble Avalokitesvara replied to the Venerable Sariputra, saying:--If a son or daughter wishes to study the profound Prajna-paramita, he must first get rid of all ideas of ego-selfness. Let him think thus: Personality? What is personality? Is it an enduring entity? Or is it made up of elements that pass away? Personality is made up of the five grasping aggregates: form, sensation, perception, discrimination, consciousness, all of which are by nature empty of any self-substance. Form is emptiness, emptiness is not different from form, neither is form different from emptiness, indeed, emptiness is form. Also, sensation is emptiness, emptiness is not different from sensation, neither is sensation different from emptiness, indeed, emptiness is sensation. Also, perception is emptiness, emptiness is not different from perception, neither is perception different from emptiness, indeed, emptiness is perception. Also, discrimination is emptiness, emptiness is not different from discrimination, neither is discrimination different from emptiness, indeed, emptiness is discrimination. Also, consciousness is emptiness, emptiness is not different from consciousness, neither is consciousness different from emptiness, indeed, emptiness is consciousness. Thus, O Sariputra, all things having the nature of emptiness have no beginning and no ending. The are neither faultless nor not faultless; they are neither perfect nor imperfect. In emptiness there is no form, no sensation, no perception, no discrimination, no consciousness. There is no eye, no ear, no nose, no tongue, no sensitiveness to contact, no mind. There is no sight, no sound, no smell, no taste, no touch, no mental process, no object, no knowledge, no ignorance. There is no destruction of objects, there is no cessation of knowledge, no destruction of objects, there is no cessation of knowledge, no cessation of ignorance. There is no Noble Four-fold Truths: no pain, no cause of pain, no cessation of pain, no Noble Path leading to the cessation of pain. There is no decay and no death, and no destruction of the notion of decay and death. There is no knowledge of Nirvana, there is no obtaining of Nirvana, there is no not obtaining of Nirvana. Why is there no obtaining of Nirvana? Because Nirvana is the realm of no "thingness." If the ego-soul of personality was an enduring entity it could not obtain Nirvana. It is only because personality is made up of elements that pass away, that personality may attain Nirvana. So long as man is seeking highest perfect Wisdom, he is still abiding in the realm of consciousness. If he is to realize Nirvana, he must pass beyond consciousness. In highest samadhi having transcended consciousness, he has passed beyond discrimination and knowledge, beyond the reach of change or fear; he is already enjoying Nirvana. The perfect understanding of this and the patient acceptance of it is the highest perfect Wisdom that is Prajna-paramita. All the Buddhas of the past, present and future having attained highest samadhi, awake to find themselves realizing Prajna-paramita. Therefore, O Sariputra, every-one should seek self-realization of Prajna-paramita, the Transcendent Truth, the unsurpassable Truth, the Truth that ends all pain, the Truth that is forever True. Oh Prajna-paramita! O Transcendent Truth that spans the troubled ocean of life and death: safely carry all seekers to the other shore of enlightenment. Listen to the Mantra, the Great, Mysterious Mantra:--Gate, gate, paragate, parasamgate, bodhi, svaha ! "Gone, gone, gone to that other shore; safely passed to that other shore, O Prajna-paramita! So may it be." All Buddhas of the three periods of time attain Anuttara-samyak-sambodhi through reliance on Prajna Paramita. Therefore know that Prajna Paramita is a Great Spiritual Mantra, a Great Bright Mantra, a Supreme Mantra, an unequalled Mantra. Gate Gate Paragate Parasamgate Bodhi Svaha ! This mantra is for use in meditation or halfloud with a mala.